I will start off by saying congratulations to Moe Gauthier, the winner of the heaviest fish of week one. Moe certainly knows where the fish are and how to catch them. Well done Moe, the steaks and beer are on you! Since early June, I have enjoyed tremendous salmon fishing. So many people that I talk to say it reminds them of 20 years ago, albeit, smaller salmon. Lots of alewives and smelt, times were good, at least until the dreaded blood moon last week. Don’t fear salmon fanatics the fish are still around although they are sure harder to catch. I can’t complain much, the slow down has not affected me too badly. I don’t get out as often as I would like, however, so far this MESC I have managed lots of fish when I do. Nothing I have caught is a record breaker, but I am sure on a streak as far as catching (and lots of releasing) goes. With all the salmon I am getting I still want the BIG one. I am just as competitive as anyone, probably more so than most. I can not win a prize, but it would sure feel nice to catch the biggest fish of the MESC and just weigh it in for fun. Every year that is my intention, chase the big fish. This year 2x23lb trout before the classic started, last year 3 20lb+ salmon. Well, ladies and gentlemen, it is time to get serious. I have called in a local tackle company to make this happen. Bone and I have been catching lots and lots of our fish this year on old 80s NKs. In June when the fishing was slow one day Bone pulled out a couple of old rusty black and white NKs that his father Glen used to use. We put them on and guess what, the day was not quiet any longer. We have fished the crap out of those old lures and we are down to just one left (Bone lost one yesterday on the trip over to South Baymouth). In steps Epic Fishing Tackle of Sudbury. 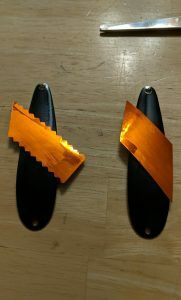 I message John Attewell after seeing a post about some hot new spoons he is creating. “I need a custom order. All black front, white back with orange tape across the front. Can you do it?” I asked. “Yes, for sure I can,” replies John. 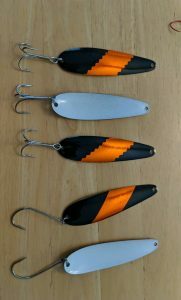 In just 2 days my lures are done and by next weekend they will be catching salmon. I can not say enough good things about Epic Fishing Tackle. So easy to work with, great walleye gear and now he is unleashing a solid lineup of spoons. Thanks, John, I really do appreciate it. 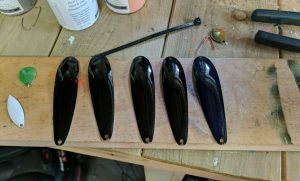 Epic Fishing Tackle spoons are powder coated and you don’t have to worry about the paint chipping off. The spoons I ordered are not part of his regular line up, but I say we petition Epic Fishing Tackle to keep creating this slayer, perhaps he can call it Manitoulin Madness? It has a ring too it. 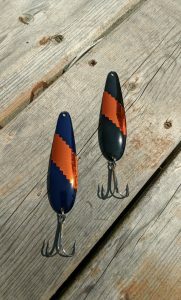 Check out the full lineup of rigs and spoons on the Epic Fishing Tackle website or follow them on Facebook. It sure is nice to keep it local! On to the fishing report. Once again South Baymouth leads the way with 3 of the 5-top fish after week one. The fishing on the south shore has slowed after the full moon of last week. It will pick back up soon I am guessing. Hot lures colours have been the greens, blacks and oranges. The chicken wing has slowed for me, perhaps because I hardly ever wash it anymore. I hear of some good catches on orange crush as well as Dr. Death. It is good to see that the North Channel is finally becoming active. Gore Bay is weighing in some fish and I hear of solid catches in West Bay. 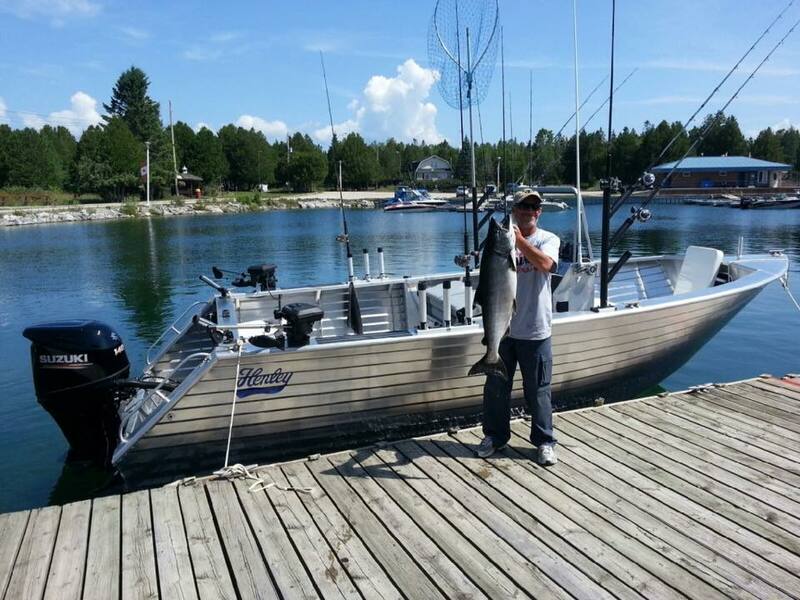 Be sure to text your photos to me at 705-968-0237 or email them to info@fishmanitoulin.com. I would love to see them and put them up on our social media pages.